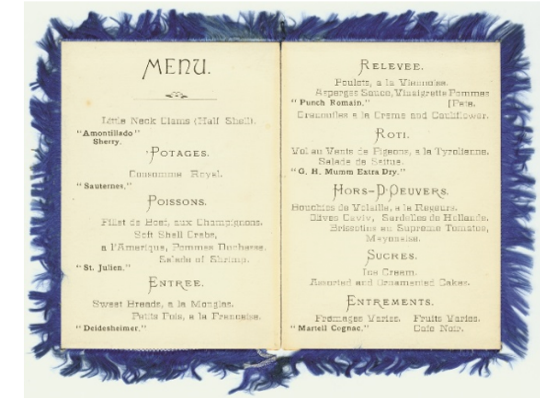 My favorite object is the menu from the Trefa Banquet in 1883 located on the 4th floor. I’m a history major, and I love finding funny and interesting events from history to bring a broader historical period or trend into perspective. The Trefa Banquet, the infamous dinner where a meeting of Jewish congregations and graduates from a Hebrew college was celebrated with entirely non-kosher foods, is such an odd and intriguing indicator of the course that American Judaism has taken. My favorite object in the Museum is the poem in Hebrew commemorating Abraham Lincoln, written by Isaac Goldstein in 1865. Located on the 4th floor, the poem spells out Lincoln’s name as an acrostic in the style of some Jewish liturgy still recited today. The Civil War era is a part of American history that I enjoy studying but had never thought about from the perspective of Jews who lived through it, and I loved making that connection. My favorite object in the Museum is the Rebecca Rubin American Girl Doll released in 2009. Rubin is a first generation 9-year-old girl living on the Lower East Side in 1914 with her Russian-Jewish immigrant parents. This object is especially meaningful to me, because my father emigrated from Russia when he was 20 years old. This doll is important not only to Jewish people but can also be relatable to anyone who is a first generation US citizen. I grew up watching baseball and going to games. I have always wanted to catch a baseball and get it signed, but it’s never happened. 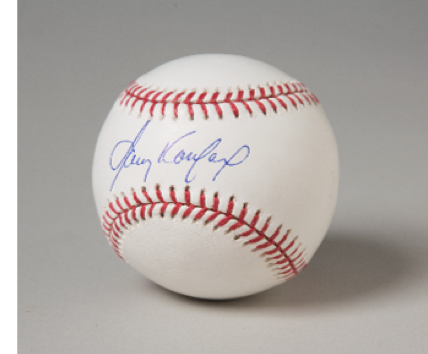 Every time I see Sandy Koufax’s signed baseball in the first floor Only in America Gallery/Hall of Fame, it makes me think of my childhood and going to games with my dad! I love Hutzler’s handbag and boots on the 3rd floor mainly because I really love the fashion trend back in the beginning of the nineteenth century. I actually love all of the objects in the “Business of Business” case in the 3rd floor gallery! I love that every object here—even a small mirror or box—is full of history. My favorite item in the Museum is the dress in the Purim Ball gallery on the 4th floor. I love looking at costumes from bygone eras because it humanizes people from the distant past. Women wore dresses just like I do today, but they were much more elaborate than the simple sundresses I wear during the summer. Costuming is also an important indicator of the social status of its owner and can tell the viewer a lot about the life of the woman who once wore the dress. My favorite “object” in the Museum is the interactive touchscreen in the “Camping” gallery on the 2nd floor that allows you to look up photos from various Jewish summer camps. I went to Jewish sleepaway camp for many years and was also a camper/counselor at my local Jewish community center. Going to summer camp was always something I looked forward to, and if you look up my old sleepaway camp (Capital Camps) on the screen, you can even find a picture of me from when I was younger! 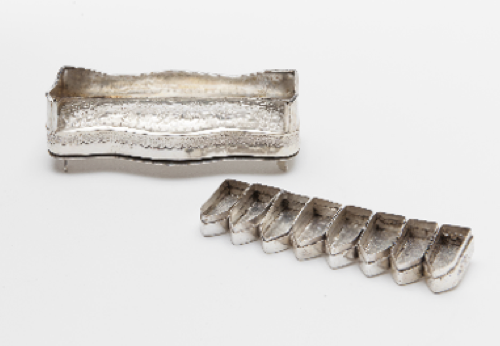 My favorite object is the small silver “couch” menorah on the 4th floor. It has a lovely simple design, and when separated, looks like a tiny couch. I love that someone created an item like this that was intended to be used on-the-move but also incorporated a whimsical design component. My favorite object in the Museum is the display of the Brooklyn Jewish Center on the 3rd floor. The miniature display features a basketball court, synagogue, and ballroom. It really interests me to see that this Jewish Center served as a precedent of sorts for Jewish community centers that followed. Interested in interning at the Museum? Visit NMAJH.org/Internship for more information. Please note that some of the objects in our permanent collection rotate on and off view for conservation purposes. Therefore, some of the objects mentioned in this story may not be on view when you visit the Museum. You can always contact Visitor Services at 215.923.3811 x160 to find our whether a specific object will be on view during the time of your planned visit. 1) Menu for the “Trefa Banquet,” Hebrew Union College, Cincinnati, 1883. The Jacob Rader Marcus Center of the American Jewish Archives. I am drawn to the “Many Peoples, One Language” poster on the third floor. I grew up in a suburb of Cleveland and always enjoy learning about Cleveland history. A few of the schools listed on this poster still exist today. I grew up driving through the neighborhoods where several of these schools were located. Many of my grandparents’ friends lived near these schools and a few even attended some of the listed high schools. The poster is a reminder of how Cleveland has both changed and not changed over the past century. My favorite object in the museum is Estée Lauder’s executive planner from 1974. It is currently flipped open to a week that includes important business meetings along with reminders to buy chicken for Seder. I still swear by owning a physical planner, so it was entertaining and inspiring to see Estée Lauder’s and witness how she was able to balance her personal and professional life in a time when women were emerging as business leaders. My favorite object in the Museum is the binder that contains the photos and names of the Jewish Freedom Riders on the 2nd floor. As a History teacher, I have taught students about the Freedom Riders in 1961 who challenged the Supreme Court decision Boynton v. Virginia, which segregated interstate transportation facilities. Having taught this topic, I thought I knew a lot about these civil rights activists. I was amazed to learn that there were Jewish participants in the Freedom Rides! This object exposed me to a new perspective on history that I thought I knew well. It is a testament to the Museum and its ability to provide an engaging lens on American History. My favorite object in the Museum is Albert Einstein’s pipe, which can be found on the 1st floor in the Only in America Gallery/Hall of Fame. I think it’s amazing that the Museum has something of such personal value that belonged to a well-known individual such as Einstein himself. According to some Museum staff, when they received the pipe, they could still smell the scent of tobacco emanating from it! These funny stories and interesting facts about various objects within the Museum make me truly believe that history is still alive. My favorite object is the wedding dress made out of a parachute used during the Second World War, located on the Museum’s 3rd floor. I think it shows a not-so-dark side of World War Two. When you hear about World War Two, it’s mostly about the horrible things that happened. Seeing something that came from a horrible place turned into something beautiful is really meaningful. I liked the wedding dress made out of the parachute because I thought it was a really touching story and the quote that was included with the dress. The woman who wore the dress basically that if the parachute hadn’t saved his life, then they couldn’t have met and got married and it was just such a great sentiment. My favorite object is the ACT UP pin, which is the last artifact you see as you leave the 2nd floor gallery. I study the history of medicine and health as it relates to gender, and am particularly captivated by the history of the AIDS crisis. I find myself both intrigued and amazed by the LGBT community's capacity to rise up and "ACT UP" in the 1980s and 1990s to advocate for their own health in the face of government inactivity and public apathy. Although the AIDS epidemic affected (and continues to affect) LGBT folk of all religions and backgrounds, the pin is a reminder that the Jewish spirit of activism was in many ways central to queer activism and the formation of groups like the AIDS Coalition to Unleash Power (i.e. ACT UP) and others. My favorite object in the Museum is the Singer sewing machine on the 3rd floor. As a fashion student, seeing the differences between what they used back then and what we use now gives me a better perspective on how fashion has changed over the years.